Two days after Gary Kubiak was tabbed as the next offensive coordinator for the Denver Broncos, Gary Kubiak will not be the next offensive coordinator for the Denver Broncos. 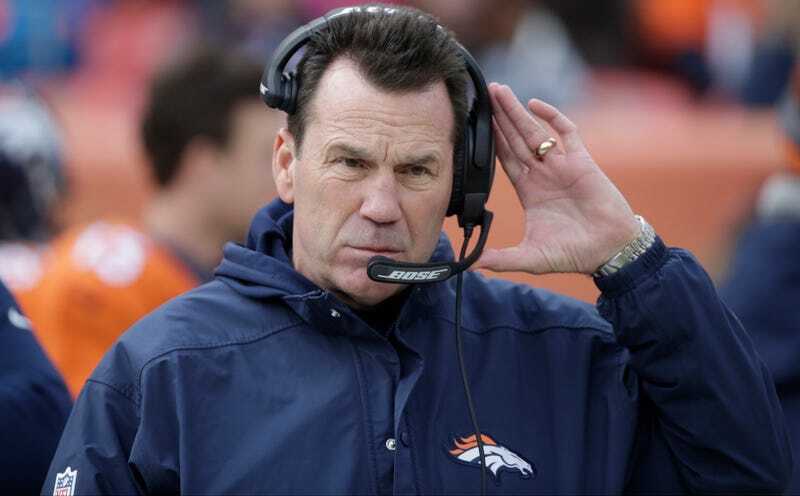 However, it turns out that reported philosophical differences will prevent Kubiak from ascending to OC. Fangio spoke about his respect for Kubiak at his introductory presser yesterday, but several key assistant coach positions were yet to be filled. Apparently the filling of said jobs was tempestuous. Mike Klis of 9 News reports that Kubiak wanted to bring back a pair of previously fired Broncos assistants, but the team wasn’t on board. Kubiak’s 31-year-old son Klint was also in the running to be quarterbacks coach. Even though Kubiak had the new job yanked away from him, he’s reportedly still under contract on the Broncos’ personnel side. It’s almost like John Elway is the least organized GM in the NFL.